A place we recommend in Tucson for truck camper shells, tonneau covers, bedliners, step bars, running boards, grille guards and other truck accessories is Arizona Truck Outfitters. Our recent experience with their customer service exceeded all expectations. 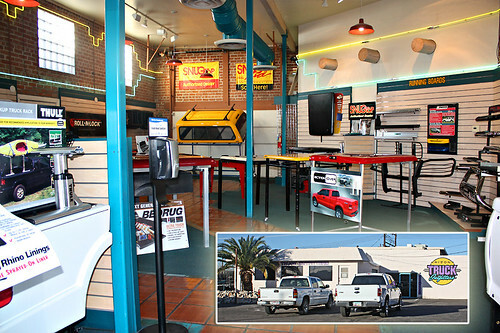 Visit them on Stone Avenue in Tucson, and for more information visit their website at AZTruckOutfittersTucson.com. Posted on January 29, 2011, in arizona, camping, cochice county, hiking, nature, recreation, santa cruz valley, travel, tucson, university of arizona and tagged arizona, arizona tourism, Arizona Truck Outfitters, arizona trucks, bedliners, camper shells, cochise county, grille guards. truck accessories, hiking, running boards, santa cruz valley, southern arizona, step bars, tonneau covers, travel, truck, truck camper shell, trucks, tucson. Bookmark the permalink. Leave a comment.